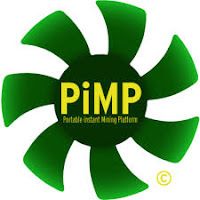 PiMP OS or Portable Instant Mining Platform is a dedicated Linux-based mining distribution intended for GPU and ASIC mining without the need to rely on Windows. According to the website, GetPimp has been downloaded over 155,394 times and has 4098 Miner.farm Users. Users will mainly interact the Miner.farm web application to monitor mining hardware and allow users to control them. The Pimp OS costs $30 and requires users to have a hard drive or SSD in their computer, since USB drives are not supported.